High-end detached homes beyond the 416 accounted for much of January’s sales activity. TORONTO – Staying true to the Toronto Real Estate Board (TREB)’s predictions for another strong sales year, an unseasonably warm January wound up generating even hotter market activity than in the same month last year. According to TREB’s Market Watch report issued February 3, a total of 4,672 transactions were completed before February began — reflecting an impressive year-over-year increase of 8.2 per cent. Looking at different home types, the largest increases were seen in sales of semi-detached homes in the suburban “905” region, and townhomes in the urban “416” – which saw year-over-year sales boosts of 14.6 per cent and 14.7 per cent, respectively. Homes listed this January also spent an average of 29 days on the market, compared to 31 a year earlier. “It is clear that the handoff from 2015 to 2016 was a strong one. This is not surprising given that recent polling conducted for TREB by Ipsos suggested 12 per cent of GTA households were seriously considering the purchase of a home in 2016,” explained TREB president Mark McLean. Thanks largely to an increase in sales of high-end detached homes “in the regions surrounding” Toronto, the average home selling price for January was $631,092 — up by 10.7 per cent over 2015’s average January home price of $552,925. “Market conditions in January were tighter compared to a year earlier, with an annual increase in sales up against a decline in listings,” said Jason Mercer, Director of Market Analysis at TREB. 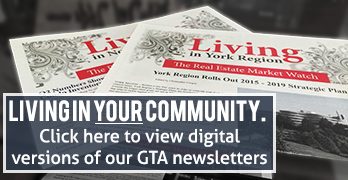 For total number of sales, Peel Region put in a strong showing with a grand total of 1,047 for the month. While York Region’s transaction total fell slightly short of that at 894, the area did post a much higher dollar volume – an impressive $726,304,860 – on the month’s sales. York Region also enjoyed the strongest regional average selling price, at $812,422 (regardless of home type).